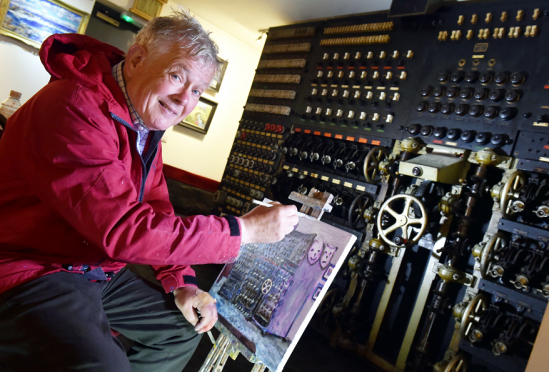 One of the north-east’s most renowned artists has immortalised a vital piece of the city’s technological heritage on canvas as part of his latest exhibition. Howard Butterworth, 72, has gained acclaim for painting the breath-taking landscapes and beautiful flowers of Aberdeen, Aberdeenshire and the rest of the country. His latest exhibition – Scotland Collected – in the arts space at the Tivoli Theatre seeks to highlight some of his greatest work from his career. Mr Butterworth said he had slowed down his artistic output, but when he saw the historic theatre’s enormous antique lighting control panel in the middle of the exhibition space, he felt compelled to paint its hundreds of old-fashioned dials, gears and levers. The owners of the Tivoli believe the Rank Strand Grandmaster machine was first built in London in the 1930s. The exhibition will run every day from 10am to 4pm at the Tivoli Theatre until September 24.